In its still undisputed role as market leader, Samsung has been driving the development of the TV sector for years. The latest expression of the South Koreans’ continuous quest for innovation is the first 8K QLED TV Samsung Q900R. We have just included the 75-inch version in our demonstration and present the most important features here. In addition to the 75-inch model mentioned above, Samsung’s QLED 8K TV is also available in 65 and 85-inch sizes. 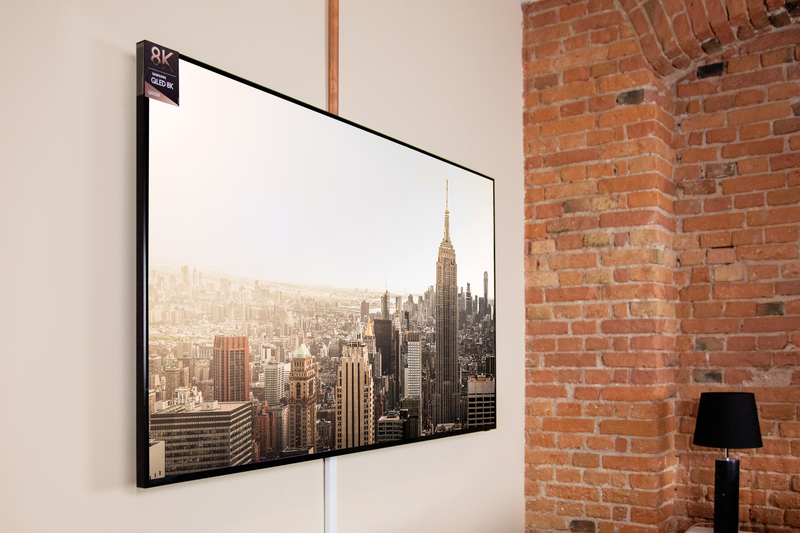 The display is bordered by a discreet frame that, in contrast to the current 4K QLED TVs, is angled outwards instead of towards the display, making it look somewhat darker. The entire panel rests on two narrow, stable and forward-facing angle feet that can be mounted closer to the center of the display as an alternative to the standard position near the edges if the TV is to be placed on a smaller piece of furniture. In the case of wall-mounting, the feet can be accommodated in recesses provided for this purpose at the rear so that they are not lost – a really good solution. 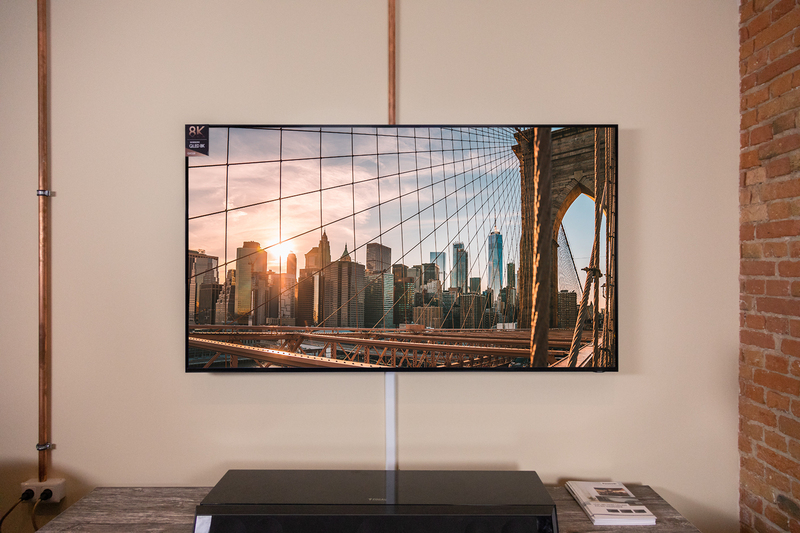 To prevent unsightly cable clutter from destroying an inconspicuous design concept in the best sense, the Samsung Q900R also comes, as usual, with the One Connect Box, which is only connected to the TV with a thin and semi-transparent optical cable. Compared to the version that comes with the current 4K models, the Q900R’s One Connect Box is larger, but with one exception offers identical connections. For example, the first HDMI socket allows 8K signals to be fed up to a maximum of 30fps and also offers some other features of the upcoming HDMI 2.1 standard. However, the interface does not yet have an official HDMI 2.1 certification, as the certification process has not yet started. Samsung, therefore, plans to offer buyers an updated version of the One Connect Box in the coming year, which will then provide certified HDMI support and thus also support higher frame rates, for example. Let’s now look at the Samsung Q900R’s current unique selling point – the 8K display – and the acknowledgment that the availability of native 8K content is currently extremely low. 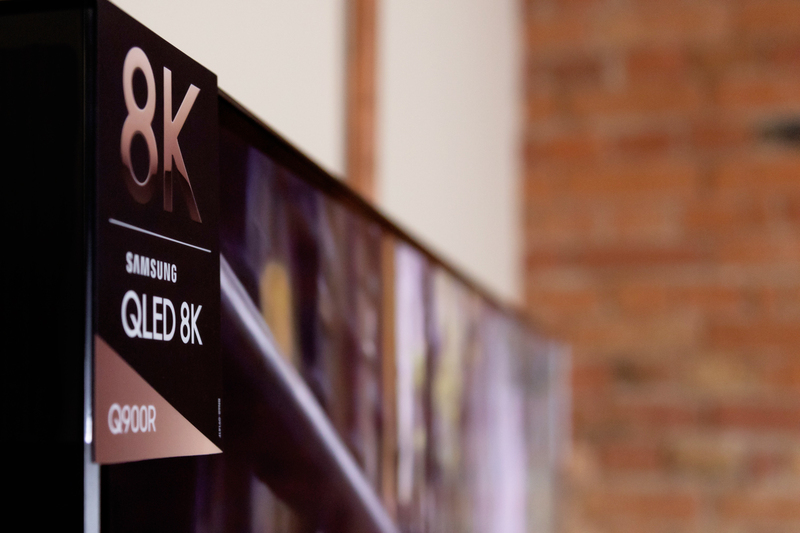 To start with, Samsung’s 8K TV is anything but a disappointment. There are a number of reasons for this, which we will look at in more detail below. First of all, the Q900R is quite simply impressive when you get your hands on 8K material. It’s true that the resolution isn’t everything, but the more sharpness, detail, and plasticity of the images is without question remarkable. This (extremely compute-intensive) image impression is made possible, among other things, by the extremely fast processor that doesn’t lean back as soon as lower-resolution video signals are fed in, but instead sets Samsung’s 8K AI upscaling engine in motion in order to give 4K, Full HD and even 720p images an amazing refreshing cure. The processor not only upgrades the resolution for the 8K display, but also uses complex algorithms that effectively filter image noise, to produce details, sharpness, and colors in an extremely tasteful way, largely avoiding unwanted image artifacts. The performance of the Q900R is top class in this respect. As far as sound is concerned, the Q900R operates at about the same level as comparable 4K models from Samsung and offers a good and clear reproduction, which of course is not equal to an external sound bar or even a surround system. The Eden 2.0 operating system leaves an extremely positive impression, and the included Smart Remote lets you navigate quickly through the menu structure. Of course, all important services such as Netflix, Amazon and Co. are also integrated. The Q900R from Samsung marks a successful start into the 8K world, which unfortunately still lacks available material. At the same time it’s impressive what the 8K AI upscaling engine can do with lower resolution content. The best way for interested parties to get their own picture – for example in our TV studio. There, a direct comparison to the 4K devices is also possible without any problems. Our Samsung Q900R video is now online.